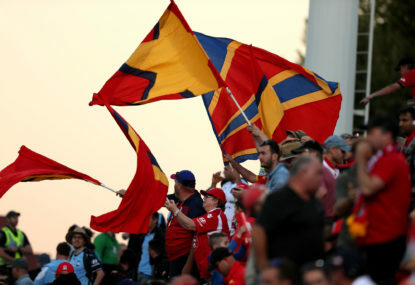 Adelaide United takes on Melbourne Victory with home finals on the line in Round 26 of the A-League at Coopers Stadium on Good Friday at 7:50pm (AEST). Join The Roar for live scores and a blog of the match. 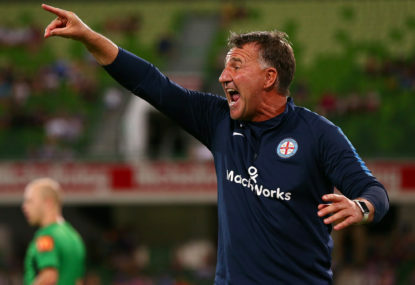 Match result: Melbourne City have strengthened their hold on a finals spot with a dominant 4-1 win over the Brisbane Roar on Friday night. The Brisbane Roar will host Sydney FC tonight in a match that the Sky Blues will have marked down as a must-win. 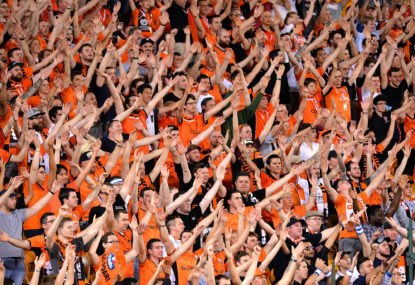 Join The Roar for live scores and a blog of the match, starting from 7:50pm AEDT. Match result: Victory took three valuable points tonight after a strange game against the Roar where they simultaneously looked comfortable and uncomfortable all night. 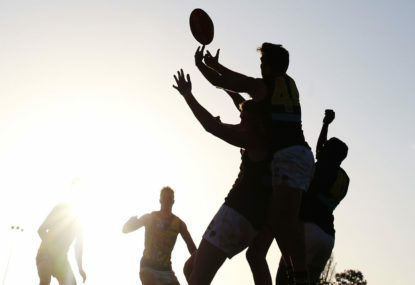 It’s a pre-season Derby over in the West – Mandurah to be precise – as the Fremantle Dockers take on the West Coast Eagles at Rushton Oval. Join The Roar for live scores and blog from 7:10pm AEDT. 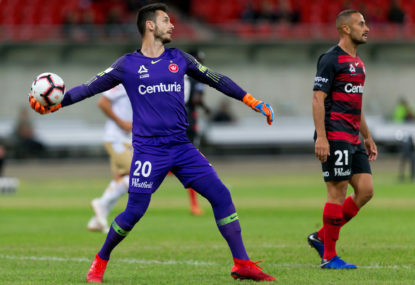 It’s Vedran Janjetovic redemption day as Round 21 of the A-League continues with Brisbane Roar taking on Western Sydney Wanderers at Suncorp Stadium at 7:50pm (AEST). Join The Roar for live scores and a blog of the match. It’s a top four clash in Round 21 of the A-League as Sydney FC take on Adelaide United at Leichhardt Oval at 7:50pm (AEST). Join The Roar for live scores and a blog of the match. 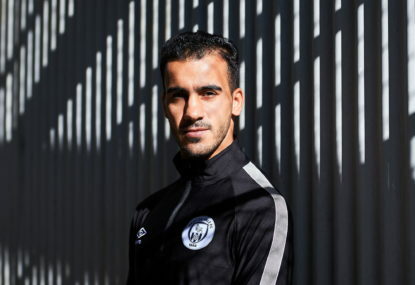 It was a celebration of the power of football on Friday night as released footballer Hakeem Al-Araibi returned to his home ground on match day for the first time. 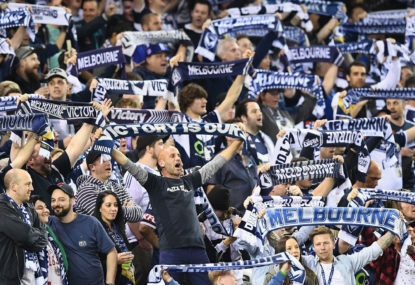 Match result: We hoped we would be treated to a Melbourne derby for the purists. Instead, we were offered a game only fit for insomniacs. It’s midtable fare in Round 18 of the A-League, when the Newcastle Jets take on Melbourne City at McDonald Jones Stadium at 7:50pm (AEST). Join The Roar for live scores and a blog of the match. 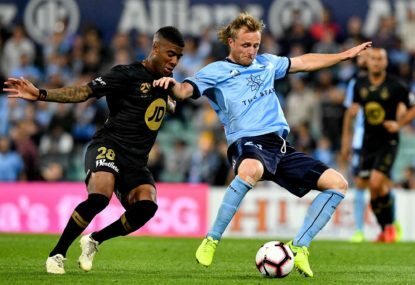 Sydney FC face an opportunity to close the gap on the top two when they take on Brisbane Roar in Round 18 of the A-League at Suncorp Stadium at 7:50pm (AEDT). Join The Roar for live scores and a blog of the match. “If they win this game it’s been pinched” groaned a despondent Peter McKenna on a cold bleak Adelaide night in Queen’s Birthday eve 1991, moments before Rod Jameson drove a nail into the old VFL. 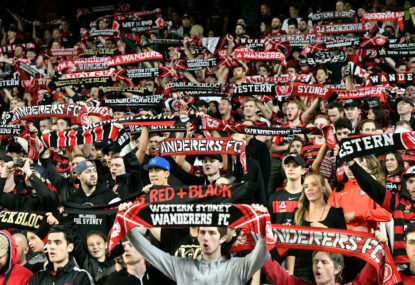 The not-yet-relegation battles continue on Friday nights in 2019, as the Western Sydney Wanderers are back at home taking on the Newcastle Jets, in Round 17 of the A-League at ANZ Stadium at 7:50pm (AEST). Join The Roar for live scores and a blog of the match. 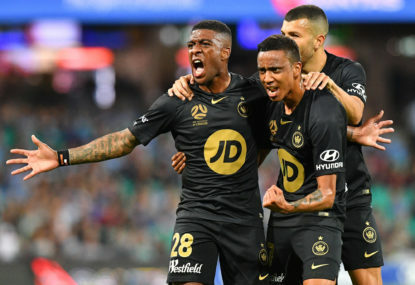 This season’s real underachievers, Brisbane Roar and the Western Sydney Wanderers, take each other on for bragging rights and to keep alive a mathematically improbable chance of finals in Round 16 of the A-League at Suncorp Stadium this Friday evening at 7:50pm (AEST). Join The Roar for live scores and a blog of the match. Round 14 is a chance for the Western Sydney Wanderers to dispel their demons after a regrettable few weeks (and season) when they take on Adelaide United at ANZ Stadium this Friday evening at 7:50pm (AEST). Join The Roar for live scores and a blog of the match. 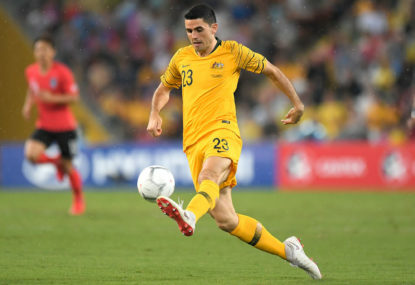 Australia’s 3-2 defeat of Syria in their final group game in the AFC Cup had resonance beyond the scoreline and the official booking of the Socceroos into the next round. 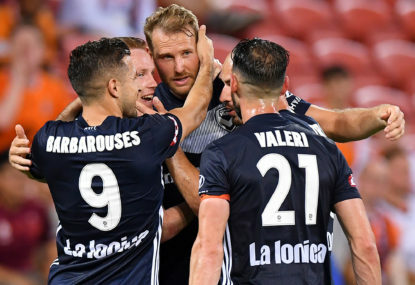 The whirlwind of summer fixtures in the A-League continues, as Round 13 finds a teetering Melbourne Victory host Newcastle Jets at AAMI Park on Saturday evening at 7:50pm (AEST). Join The Roar for live scores and a blog of the match. 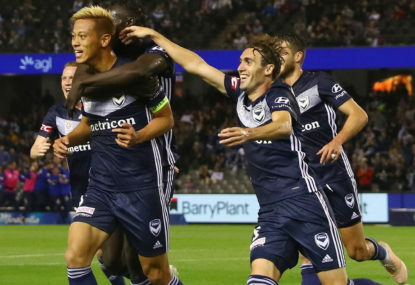 Match result: The absence of Keisuke Honda didn’t stop Melbourne Victory recording a 2-1 win away from home against the Western Sydney Wanderers. Round 6 finds backs-to-the-wall Melbourne City hosting Newcastle Jets at AAMI Park on Sunday evening at 7pm (AEST). Join The Roar for live scores and a blog of the match. Round 5 is upon us, after an interminably long international break, and brings together underperformers Western Sydney Wanderers and Newcastle Jets at Spotless Stadium in Sydney’s Olympic park at 7:50pm (AEDT). Join The Roar for live scores and a blog of the match. He has said in interviews he would like to play in the A-League…. he also said, on the night, that now that he’s earnt some celebrity he’s eager to show everyone what he’s made of on the pitch. Who knows? He may have what it takes to join an A-League club. Right now he faces a long road back to health and fitness. Did I mention BEN HALLORAN ? They don’t actually own McGree either…. so they won’t get a payday for him if he does develop nicely for them and then move to Europe. Atkinson is probably their best local hope – in raw, sterile economic terms. They might want to develop Atkinson into a midfielder – now that he’s back get him into the role Baccus is filling. Or he withers on the vine. Hopefully they have SOME plan for him. 1) I wrote “the brand can afford”, as in brand equity not $$. For the same money they are actually paying Joyce I’m sure they could have found a coach with better credentials. Markus Babbel – by way of example – can at least point to getting Hertha Berlin promoted from 2 Bundesliga as an example of him getting good results from a group of professions. Joyce can’t do this. 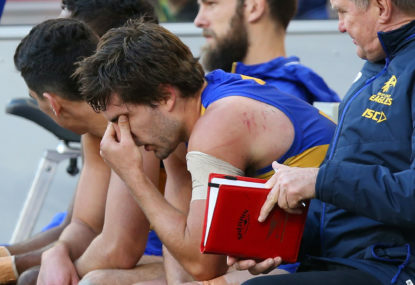 2) Good or bad, Heart were a club in the A-League of which we are all invested (in the very least, emotionally). 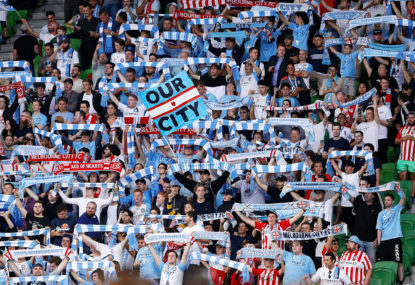 By giving up Heart to the City group we are utterly entitled to see their investment improve the quality of the A-League. I think the start was strong but they have devolved since Joyce was appointment, which also coincides with a lack of direction with recruitment. Yes they have invested well in the Academy and the W-League. Overall we’re net positive – which makes the Joyce selection all the more puzzling/disappointing. If it’s any consolation, it is an issue that effects other nations. Switzerland basically had no teeth in their round of 16 game against Switzerland. So many balls whipped into the box that were cleared with ease by the Swedes. Germany look ineffectual in games were Timo Werner doesn’t show up (which was, basically, the entire tournament). Most countries would KILL for a player like Lukaku who can link play as well as convert. Ahh Robbie Kruse…. the most blameable man in world sport. Yes this one – appallingly bad penalty!! That first Russian penalty – Smolov I think (?) – WHAT was he thinking there!!??? A panenka hit into a corner?? That has to be one of the brain fades of the cup. There was one on FourFourTwo about getting the fullbacks too far forward…. that effectively created Peru’s two scoring chances. ….. I can’t find the article though – and the article I THOUGHT contained this argument doesn’t. Perhaps it came to me in a fevered waking dream as a byproduct of sleep deprivation. I reckon the early Peru goal pretty much ruined BvM’s game theory RE Arzani. It was clear in this selections that he was probably hoping to get to the hour mark and then go for it with an open game. Therefore we needed to still keep our defensive shape until the hour. After that early goal It closed the game down and diminished the impact Arzani might have had. Incidentally if you look at the heat maps and compare them in the Denmark and Peru games, the only real difference was that our fullbacks got higher up the pitch. Alas Peru’s two goals were manufactured in the wide spaces. I’ve read analyses that he could have been MORE defensive against Peru to get to the 60th minute at 0-0… and that theory definitely has legs. Ultimately you create chances to shoot which are converted or not. You’re right – we converted none. The question is – is that because our play was poor, our chances made were low quality or do we just need to find better forwards? Those questions will be important for Graham Arnold to have answers for – especially as he generally favours the same 4-2-3-1 that BvM employed. Sweden win this game with a lucky strike from their star Emil Forsberg in the 66th minute that took a wicked deflection off Swiss defender Manuel Akanji. It wasn’t a pretty game, and both teams battled to impose their style and create meaningful opportunities. Neither side was able to emulate their brighter moments from the Group stage; in particular Switzerland who struggled to create value out of their overwhelming weight of possession (68% vs Sweden’s 32%). This wasn’t a vintage Swedish forward performance by any means, but their goal was well taken (albeit very fortunate). Forsberg drifted in and out of this game but was able to find enough space for the shot which turned out to be enough to settle this match. Swiss didn’t seem to be equipped or set-up to exploit the enormous weight of possession they had. Sweden was always going to give the ball to Switzerland, but the Swiss wasted their possession by trying too often to whip crosses into their smaller forwards – Drmic for much of the game – who was never going to be able to outjump or outshine the big Swedish defenders. The second half in particular was a real test of Swiss skill and patience, as the Swedish midfield block – martialled by Albin Ekdal – allowed little space or time on the ball for the creative Swiss midfielders to put through their forwards into dangerous positions. Switzerland had 11 corners in this game, but each one was cleared with relative ease by the Swedes who had enough bodies in the box to also block the countless shots from those clearances. Goalkeeper Robin Olsen was tested, but was imperious in goal and is in red-hot form in this World Cup. Ultimately the story of this tournament for Switzerland was indeed their inability to capitalise on their approach play, and the absence of a top shelf forward capable of finishing off the great work of elite midfielders like Shaqiri and Xhaka. This game will be used as exhibit A for that analysis in Swiss post mortems. In the end the Swiss striker – Drmic – next to no impact in a game dominated by the Swedish central defenders Lindelof and captain Granqvist. The best – and only real – chance came from Dzemili in the first half and after that was skied over the bar after some clever approach play. Alas for Switzerland they were unable to create another chance like that for the rest of the game. Breel Embolo – who came in that second half – offered some run and industry on the left hand side – getting into the box in a handful of cases but ran into a wall of Swedes on each occasion. On reflection starting with Embolo added a ground-threat to the Swedes and put them on the back foot, but this was a poor tactical game for Swiss manager Vladiimir Petkovic who’s plan A was nullified with ease by the Swedes. There will be dancing in the streets of Stockholm tonight. The Swedes are into their first quarter final of a World Cup since their Semi Final run in USA 1994. They will now face the winner of today’s late game between England and Colombia. The big concerns out of this will be Emil Forsberg, who looked ginger coming off late in that second half, and seems to have picked up a knock. Right back Mikael Lustig of Celtic will definitely miss after picking up his second yellow card of the tournament, but one feels that Forsberg’s spark will be harder to replace than a defender. But Sweden go through tonight in an armwrestle – and a bit of a let down after the excitement of the other knockout games in this World Cup – winning 1-0. There’s late drama as a penalty to Sweden is overturned by VAR as the challenge was made just outside the box – but it’s immaterial for the Swedes. Toivonen batters his free kick, and it’s saved, but the referee calls fulltime seconds later. So Sweden go through here into a Quarterfinal, and will face either England or Colombia. Switzerland had their chances but were toothless in front of goal and could not break down the Swedish defense with any great intelligence. 94′ – PENALTY TO SWEDEN! and a RED CARD to Lang! The Swiss have everyone forward and Olsson breaks and Lang takes him down when he’s through on goal. 93′ – Everyone is back here for Sweden! A clearance hits the ref and plays Embolo in but they still can’t produce any quality with the final ball! 92′ – Shaqiri runs the wide right space with urgency but his cross goes nowhere. They haven’t learned a thing in this game! 91′ – SAVE FROM OLSEN! Fantastic save! Seferovic gets his head on the end of a cross but his low shot is stopped with command from the Swedish keeper. The Swiss are going home if they can’t find something here! 87′ – The pressure is intense here from Switzerland but they cannot find a an avenue to goal. There are 6 minutes + left here for Switzerland in this tournament if they can’t find the equaliser!